Ubud is the cultural epicentre of Bali – a rich, artisan workshops museums, meditation and yoga centres, Balinese dance & gamelan troupes and international festivals, including a world class literary gathering – the Ubud Reader’s & Writer’s Festival (URWF). 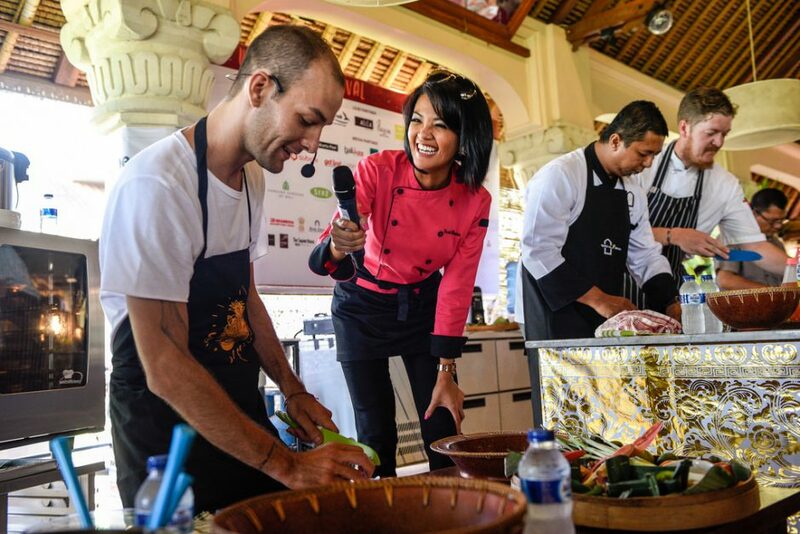 Two years ago, the team behind URWF decided to bring more awareness to another element of contemporary Bali culture that’s currently booming – the culinary arts. The Bali Food Festival takes place in April after the rainy season when the air is fresh and clear and the sun is shining once more. It is a sophisticated celebration of all things food, emphasising local ingredients, farm to table, creative new approaches and timeless classicism. Bali boasts a cosmopolitan dining scene unlike anywhere else in the world. You can find world-class versions of pretty much every culinary tradition you’d care to name on the island – from classical French to Vietnamese Pho to Peruvian ceviche to English pub grub. Plus of course Indonesia’s own diverse and intricate offerings. Put simply, Bali is a foodie’s dream come true. The Ubud Food Festival distils all these traditions in one place, with stalls allowing guests to sample food from around the world, including the very best that Bali and the rest of Indonesia has to offer – from succulent babi guling (roast suckling pig) to Balinese sate known as sate lilit. Karma Mayura is the perfect base for festival goers and Ubud explorers alike – a tranquil riverside retreat in the village of Mas, just minutes from central Ubud. Decorated with local arts and crafts and serving its own exquisite renditions of local Balinese dishes, the resort perfectly reflects its milieu. One of the highlights of the Ubud calendar, the Ubud Food Festival offers a great opportunity to experience the best of Bali’s cuisine, while discovering all the other aspects of the island’s unique culture. Bavarian Cuisine – The Definition of Good, Hearty Country Eating!